As screens shrink, so do ad rates. Advertisers want to be where our eyeballs are. So it’s not surprising that, as consumer attention shifts to smartphones, ad dollars are following. In 2015, U.S. mobile advertising totaled $20.7 billion, up 66 percent from 2014, according to a PricewaterhouseCoopers study. So far, though, most advertisers are paying much less than they did for digital ads shown on computers. Exclusive ad rate data from major mobile ad networks — reported here for the first time — lays bare which kinds of mobile ads generate the most money — as well as the least. The information comes from Appodeal, a company that optimizes app publishers’ inventory and gets mobile ad networks — including those owned by Google, Facebook, and Twitter — to bid for ad space. The numbers show a major geographic divide. Globally, the average mobile ad sells for an effective CPM of 43 cents. * But the average mobile ad in the U.S. goes for an effective CPM of $2.01. The kind of mobile ad being purchased — banner, native, video, or interstitial — can have just as big an impact on price. Though mobile banner ads make up around 80 percent of mobile ad inventory, mobile interstitial and video ads bring in about six times as much on average. Globally, they bring in 12 times as much. Smart publishers are experimenting with more lucrative mobile ad formats, according to Appodeal CEO Pavel Golubev. “They integrate native ads,” he said at a conference earlier this year. 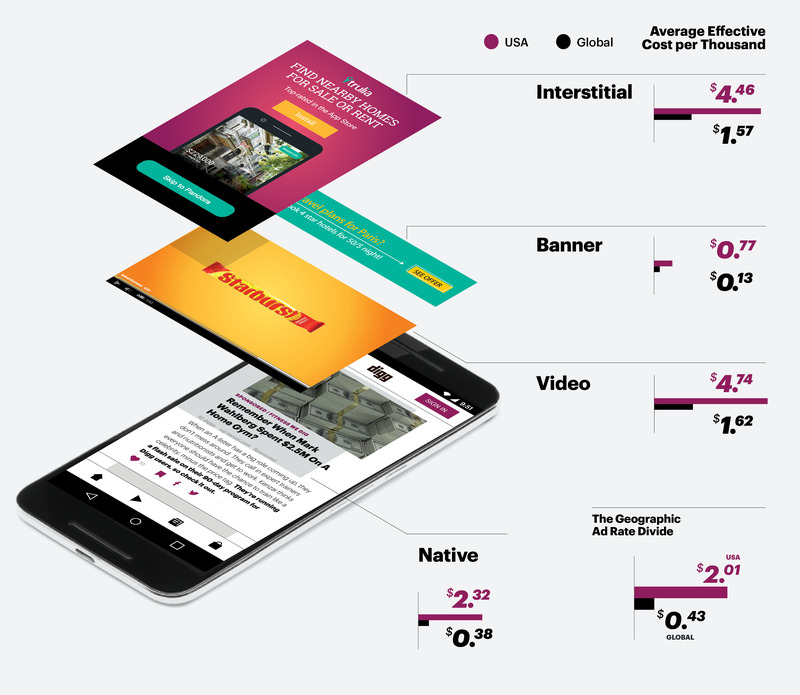 “They analyze performance of interstitials, and they introduce videos.” But, for most publishers, relying exclusively on higher-priced ads isn’t an option since there isn’t enough demand. “We still see the effective CPMs of display outperforming video,” Reid says, “mainly because fill is so low.” In other words, even though mobile video ad rates are significantly higher, ad networks don’t have enough video ads to serve one every time a publisher requests one. * These numbers were calculated from a week’s worth of mobile ad data from March 2016 provided by Appodeal, as well as from weekly first-quarter 2016 data from Appodeal showing eCPM averages for native, video, banner, and interstitial mobile ads. There are various units of exchange in digital advertising. A common one is CPM, or cost per mille (thousand). If a publisher charges $1 per CPM, that means an advertiser pays $1 for each 1,000 times its ad is displayed on a screen. But CPM doesn’t account for whether or not someone clicks on an advertisement or buys something. So many advertisers prefer performance-based pricing such as cost per click (CPC) or cost per acquisition (CPA). Effective CPM (eCPM) allows publishers to compare revenue from different types of ads. It is calculated by dividing ad revenue by number of impressions per thousand. CPM, CPC, and CPA ads can all be converted into eCPM.